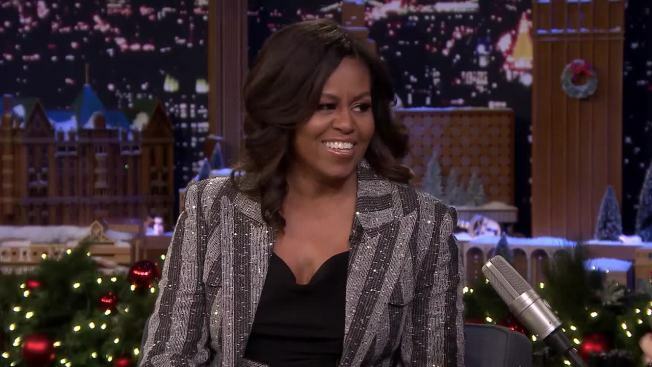 The former first lady touched on her new memoir, "Becoming," marriage counseling and what she was thinking as she left President Donald Trump's inauguration during an interview on the "Tonight Show"
Former first lady Michelle Obama had one thing to say as she left President Donald Trump's inauguration nearly two years ago: "Bye Felicia." Obama, who's on a book tour to promote her new memoir, "Becoming," was a guest on the "Tonight Show" with Jimmy Fallon Tuesday night. "That was a day," she said, as she spoke about leaving the White House. "And right before that, my daughter's friends decided they needed a sleepover for the last day. I was like, 'Are you guys kidding me? We're leaving!'" Between all of that, plus the Tiffany's box handed to her by first lady Melania Trump on live television, Obama said, "It was just all a lot." During the interview she touched on going to marriage counseling with former President Barack Obama, as well as why she believes the stories shared in "Becoming" resonate with so many people. "One of the reasons why this book is resonating with so many people is because they seem themselves in my little journey," she said. Obama, with Fallon by her side, also surprised people riding in the 30 Rock elevators. The episode also featured an appearance by Ariana Grande, who made a cameo in an "I Wish It Was Christmas Today," performance.